Daniel Casara first enlisted in the military while in college in 1994. He spent many years serving in the Illinois National Guard while simultaneously working for the Department of Corrections in Illinois, and as a loan officer for a private mortgage company. He went on his first deployment to Iraq as a human resource specialist with the 1st Battalion, 184th Infantry Regiment in 2005. On Sept. 23, 2005, Army Sergeant Casara was severely injured when his vehicle flipped over after rolling over an anti-tank mine in South Baghdad, Iraq. SGT Casara sustained bilateral fractures to his right tibia and fibula, a shattered left tibia, shattered heel and ankle bones to both feet, and a dislocated right hip. Daniel has undergone 24 surgeries and countless hours of physical therapy. Now medically retired, he lives with his wife, Basia, his teenage son Denali, and mother in San Diego. 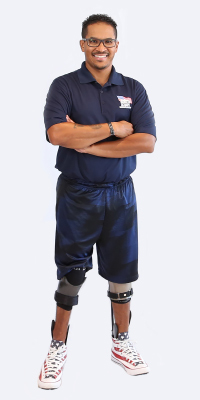 An advocate for fellow Veterans and his community, Daniel ran for U.S. Representative in the 52nd Congressional District in California during the 2018 election. He hopes to educate and inspire others by staying involved. “I have a passion for people,” he says. Though Daniel spends much of his time supporting others, he still experiences challenges within his home. He says receiving a single-level specially adapted custom home from Homes For Our Troops will be extremely beneficial, as it is difficult for him to climb stairs. He is also looking forward to having a roll-in shower with a bench. Most importantly, the new home will be a place for Daniel and Basia to grow old together. The couple has moved several times throughout their relationship. “We will finally be home,” he says. Originally from Illinois, Daniel is choosing to build his home in Southern California for the area’s warm weather and strong Veteran community. Daniel says he and his family are extremely appreciative and grateful to HFOT’s donors and supporters. “This home will be life-changing and allow us to affect so many more lives,” he says.